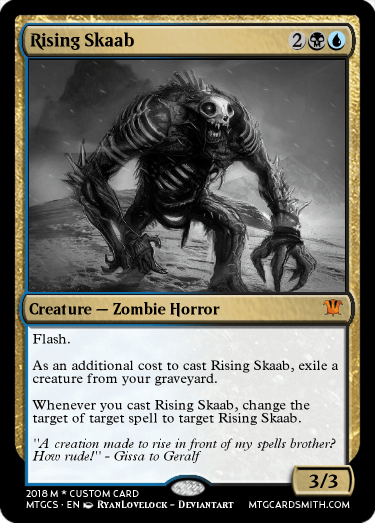 As my username perhaps suggests, my favourite creature type is zombies. 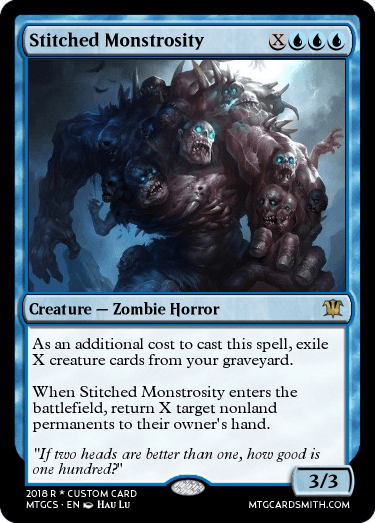 I have a (moderately) powerful casual zombie deck which, thanks to core 2019, got some sweet new additions. There are still some missing pieces though. That's why I created this competition! The requirements are demanding, so prepare yourselves. 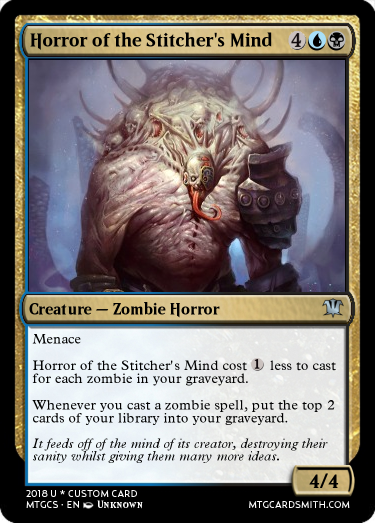 You need to create a Zombie creature card. It must be Dimir (blue/black) colours and be powerful without being broken. It must also solve one of my following problems. It can solve more than one, but you won't get bonus points for solving more than one. If you can solve all of them in a single card I will be impressed, but you still won't get bonus points. Problem one: I need another powerful and aggressive two drop to go alongside my Graveyard Marshals. Problem two: I need a way of protecting my powerful zombies and my lords from removal. Problem three: I need an (in colour) way of dealing with pesky enchantments, even if it is only temporarily. Problem four: I need a way of generating a lot of black mana in one turn to cast a kicked Josu Vess. Problem five: I need a way of getting a lot of cards in my graveyard quickly so I can start casting my Dread Wanderers and other similar creatures from the 'yard. As I mentioned above this has to be a zombie CREATURE. Why? Because I want to maximise the power of my lords, so as many of the cards in my deck as possible have to be able to benefit from them. 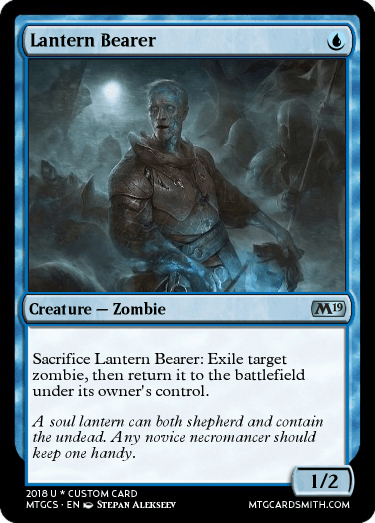 The one exception that I will permit is an instant or sorcery that also creates zombie tokens. As if that wasn't hard enough, the card must be flavourful. 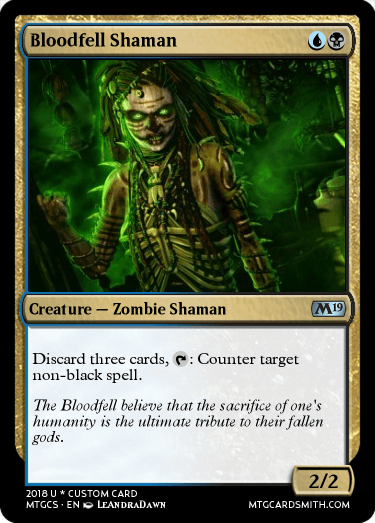 What's the point of playing a zombie deck if they don't feel like zombies? 1st place: 5 favourites of your choice, a follow and a spot in the hall of fame! 2nd place: 4 favourites of your choice and a spot in the hall of fame! 3rd place: 3 favourites of your choice. All cards I like (which will likely be all of them) will be favourited and these favourites don't count towards your prizes. Good luck! Make me some amazing zombies! Serious question though: how come we cant go white? There are white zombies. @fiskerton - I think it's so he can make some additions to his Dimir deck!! I will SO be dropping entries. I managed to get a single copy of the Scarab God really cheaply before the price spiked. He is the best card of the deck and my favourite legendary creature EVER. I don't care if it's not really built to maximize his potential, he is just amazing. I had always considered adding a white splash to my deck, but I'd like to see whether you can build into my Dimir restrictions for this challenge. Problem two + single lockdown. Hey @Undead @Dechujoh64 says hell submit cards to your contest if you ask him how's he feel about scarab god lol. (I run it a lot in games we play). I'm going on holiday for a couple of weeks and won't be able to respond to your comments for a while. I hope this competition gets a lot of entries in my absence! I may need to re-balance this but... it's problem #2. Protect one of your creatures and, depending on the spell, get a 3/3 on the field. 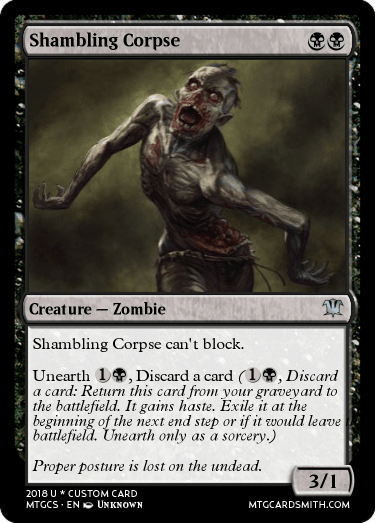 Also... can the powerful card going along-side graveyard marshal be a one drop by chance, or must it be a two drop? I have a card that fits near perfectly minus that addendum. And here's problem 5. Should allow a faster path to getting creatures in the grave. @Undead Here for problem number 4. You can cast a kicked Josu Vess if you also have the Swamp and Dark Ritual at turn 1 if you want. But only in EDH because you have more life else you would just kill yourself lol. You didn't say no pre-existing cards, so I'm going to start with one that I've got that's a pretty aggressive 2 drop. 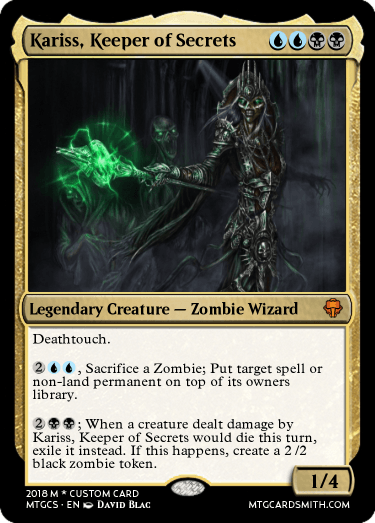 Unlike most Zombie lords, he doesn't grant special abilities- so he's got the standard zombie box (2/2 for 2) with just being a lord. 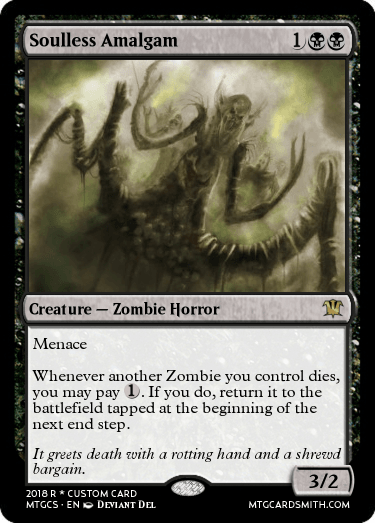 As I said, I like my Zombies mono-black... but trying to stretch myself, so I went after problem three knowing there's really no way to do that in black... My first attempt... slipped. I like the card I made, but it wasn't a zombie. 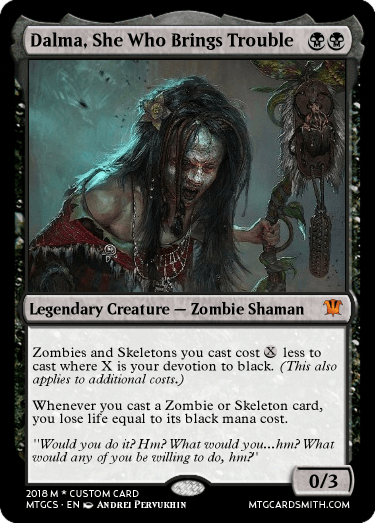 I think I got something Dimir zombly that answered the question on my second take. "Gunawr, stop nibbling at the candied hearts! Honestly though . . . I dearly apologize for my servant's manners, even if I added a brain, he certainly wouldn't know how to use it. More lymphwine, Supreme Unchancellor?" a powerful two drop, you say? Problem #5 now you just need zombies!!! Oh and draw power to combo with this enchantment. Entry 2: For problems 4 and maybe 1. It allows you to be much more aggressive, in any case. Alright! This competition is now closed for judging! All the entries look great... it's going to be hard to select a winner. Third Place: https://mtgcardsmith.com/view/underpalace-seneschal by @Temurzoa ! This card is pretty unique and very interesting. 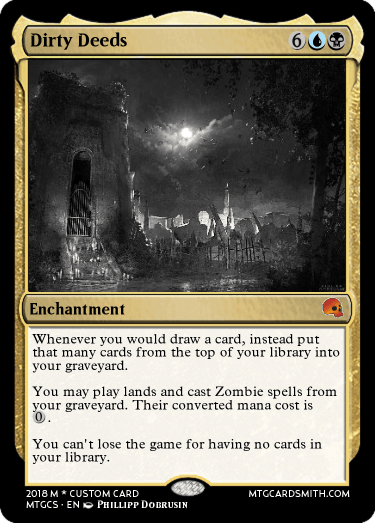 Foregoing a draw to get some extra cards in the graveyard is certainly an interesting idea, especially since with zombie cards like Gravecrawler and Skaab Ruinator putting the card in the graveyard is the same as drawing it. While I'd have to edit my deck composition slightly, I feel like this could well slot in and be a fun and interesting two drop. Second Place: https://mtgcardsmith.com/view/reaper-of-the-damned-2?list=user by @bnew07 ! I like this card a lot because it's very elegant. All the different sections of the card come together to create something powerful that's greater than the sum of its parts. 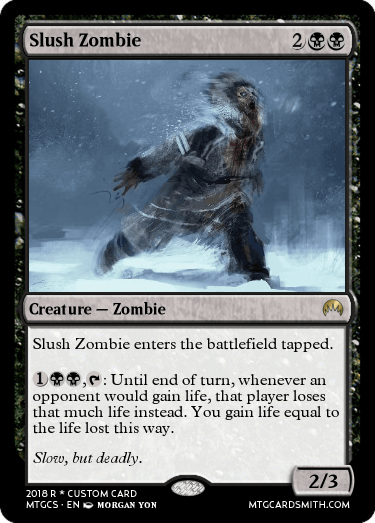 The lose 1 life when a Zombie dies ability, similar to that of Diregraf Captain and Plague Belcher, provides great value even without the sacrifice ability. 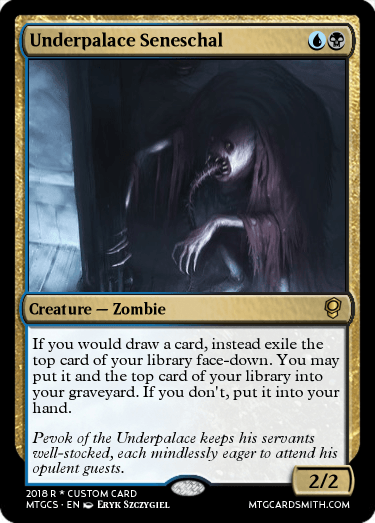 First Place: https://mtgcardsmith.com/view/undead-necromancer by @DeepSky ! 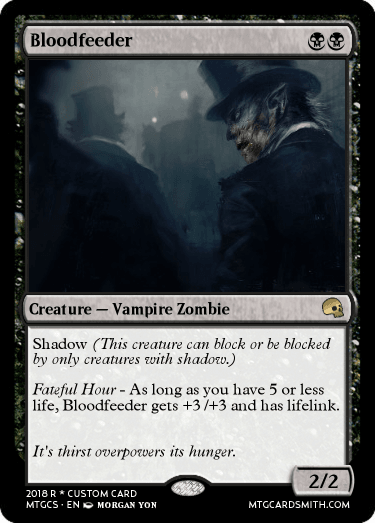 Lifelink and evasion together are really powerful (my most hated card is Vampire Cutthroat. Really annoying once it gets going), and this necromancer feels like a pretty strong two-drop. Late game it also serves as a source of recursion. The reanimation ability here feels pretty balanced. The flavour of the card is spot on and the idea is really cool. While it was a tough choice, this card just about squeaked ahead to first place. Well done to all those who participated, your entries were all great. Winners, please name your prizes.